Mi Chunche: 119: Texas BBQ Sauce in Costa Rica... Wow!! We are planning a fiesta to celebrate our new Rancho and we've been trying to plan our menu. One of the things we have both been craving is good old Texas barbecue with some of John famous Texas BBQ Sauce. We talked about trying to make it with some of the local ingredients, but decided it will be next to impossible to replicate the taste with what's available. 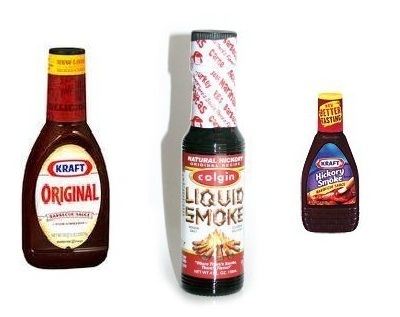 So, the other day we needed to go to the local membership warehouse called PriceSmart (think Sam's Club or Costco) to pick up some bulk items and low and behold, if John didn't spot Kraft Original Barbecue Sauce (the actual base for his Texas BBQ Sauce) sitting on a shelf. Of course we grabbed two extra large bottles, thinking we just might be able to do this if we can fine a few other ingredients. Today, we needed to get our old 1994 Isuzu Rodeo's (Suzie) annual vehicle inspection. While we were out, we decided to pick up a few essentials for the fiesta next week. So, on the off chance we could actually find Colgin's Liquid Hickory Smoke, another key ingredient for the BBQ sauce, we went to the AutoMercado in Alajuela. The AutoMercado is a high-end grocery store that stocks lots of imported goodies. Unbelievably, there, camping out on one of the shelves, sat both Colgin's Liquid Hickory Smoke and Mesquite Smoke. We were really amazed at the price. In the states Colgin's sells for $1.80 and the AutoMercado carries it for only $2.65. Considering that a batch of John's famous Texas BBQ sauce will last us months, this is really a bargain and we don't mind paying the extra for the imported goods. If you'd like the recipe for John's Texas BBQ Sauce click on the link. You guys need to open a restaurant! Texas BBQ? Wowsa indeed. When we visit our TX friends, we always pig out at Rudy's. Can't wait to taste John's Famous. We can arm wrestle over that opinion at the fiesta! Gilleys? Never heard of it. Must be a local home brew? No need to arm wrestle, we use a dry rub for cooking the meat, but then you gotta have the sauce for dipping! If you saw the movie "Urban Cowboy," you've seen Gilley's Bar/Honky-Tonk. The singer, Mickey Gilley had his own brew at the bar, but the place burned to the ground years ago. Thanks for the refresher on Mickey Gilley and his place. That shook loose the cobwebs.